I loved this book, which turns the traditional story of a simple girl who discovers that she's secretly a princess on its head. Nalia, princess of the kingdom of Thorvaldor, finds her life turned upside down when just after her 16th birthday she is summoned before the King and Queen who deliver the shocking news that she is not their daughter. Because of a frightening prophecy that the princess would be killed before her 16th birthday, the monarchs decided to swap their daughter for a decoy, raising the real princess in obscurity and safety. With the help of wizard advisors to the court, they have been casting spells on Nalia her whole life, unbeknownst to her, to strengthen the disguise. Hastily removed from the only life she's ever known, Nalia, now called by her birth name of Sinda, is forced to rely on the mercy of her only living relative, a distant aunt, who is none too pleased at the intrusion in her life. While Sinda is devastated at losing her best friend, Kiernan, and the comforts of court, she isn't as hurt on one might expect by her adoptive parents rejection of her, which made sense, as they are busy with affairs of state and have mostly left her upbringing to tutors and nannies. She even reasons that it's understandable that they would give her so little to live on after leaving the royal palace, since they may fear she would attempt some kind of revenge after their poor treatment of her. Living with her aunt Varil proves to be a disaster right from the start. When her aunt asks her what sort of useful skills she has, Sinda replies that she can speak several languages, knows the history of Thorvald and its neighboring kingdoms going centuries back, is familiar with courtly dancing and fine embroidery, her aunt rolls her eyes in disgust that the girl can't even handle simple cooking and cleaning. Sinda's simplest dresses brought from court are considered too fine for everyday wear in the hardscrabble peasant village she finds herself in. For me, the story really gets going when Sinda discovers that as the dampening effects of the wizard's spells on her die off, she has a wild, untamed magic of her own, something that she must quickly learn to control, lest she endanger others with her runaway magic. It was satisfying, if a bit unbelievable, when she confronts her aunt, who offers an apology and explanation for her gruff behavior, before parting company. Returning to the city, Sinda hopes to gain admission to the wizard's college, and is shocked when she learns that places at the school are reserved for the wealthy upperclasses only, despite the dangers of having magically gifted peasantry around. Eventually, Sinda secures employment as a scribe with unconventional female wizard, Philantha, who agrees to tutor her on the sly. The final third of the book races to a breakneck conclusion, as Sinda and Kiernan uncover a vast conspiracy involving the prophets, the wizards and the royal family. Sinda's hurt pride is apparent as she attempts to redeem herself and prove that she has more value than just as a decoy. Her rude introduction to how the other half lives is something which may open the royal family's eyes to many social injustices in the land. The ending of this book was a little convoluted, but Sinda is eventually able to wade through all the court politics to a satisfying conclusion. I only felt sorry that the ending does not obviously seem to invite the possibility for a sequel! 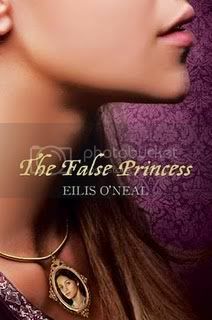 The False Princess has got to be one of the best fantasy novels I've read in a while, full of magic, intrigue, and just the barest hint of romance. I highly recommend it. Wow, this sounds so great! Its definitely on my must reads now. I love the idea of her not being an actual princess. I need to read more fantasy and this sounds great, except the ending, but maybe a suprise sequel will come. Yeah, a lot of the book is about all of her feelings, being thrust into this horrid situation of not being a princess after all, when that's what she's spent her whole life training to do. I've never heard of The False Princess, but it sounds like a lot of fun! Something about your review reminded me of Graceling and Fire - unconventional "princesses" with unconventional powers. Thanks for sharing! Ah, it's much sweeter and innocent than those two, though!